I hope you've all had a lovely, sunny Easter. What a happy few days. Amongst the glorious celebrations at our friend's wedding was an Easter Egg hunt. They hid all the eggs and shouted 'Go'. A says he's never seen me run so fast. What he doesn't know is that I've been in training for weeks now. Knowing full well the repercussions of me not returning, arms laden with chocolate eggs, A rose magnificently to the challenge and we formed ourselves a very productive partnership: A found them, I ate them. 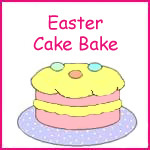 For the final cake in the little mini-series of Easter bakes I've been blogging about comes the King of the Easter cakes: Simnel Cake. Simnel Cake is a lighter, Spring-version of a fruit Christmas Cake. Less alcohol and more marzipan. Instead of penguins adorning the top, we have the Apostles. Except Judas of course, the persona non grata. Thank you very, very much- Easter wouldn't be the same without seeing how many marzipan Apostles I can consume in one sitting! The extra, spare Apostles I make don't count right? Wow...that's beautiful, and something I've never tasted! Every year I vow to make a simnel cake and it never happens... I love marzipan too so I'm not sure why... Love that you blow torched your apostles!! Thank you very much Rebekka and Sarah. It tastes really light Rebekka, and very more-ish! Sadly we don't own a blow-torch Sarah- the Apostles and the grill had to become extremely close friends instead! I really need to try Simnel Cake, I never have done yet. Looks great - well done! Happy Wedding Day Wills n' Kate! Ohh la la! Le Chocolate Macaroon!